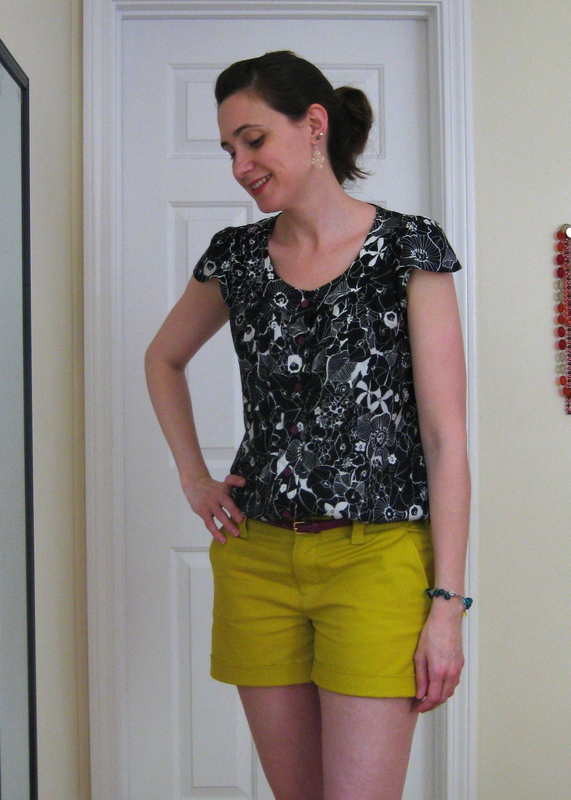 i bought mccalls 6391 years ago because i thought the shorts were cute and had lots of potential. 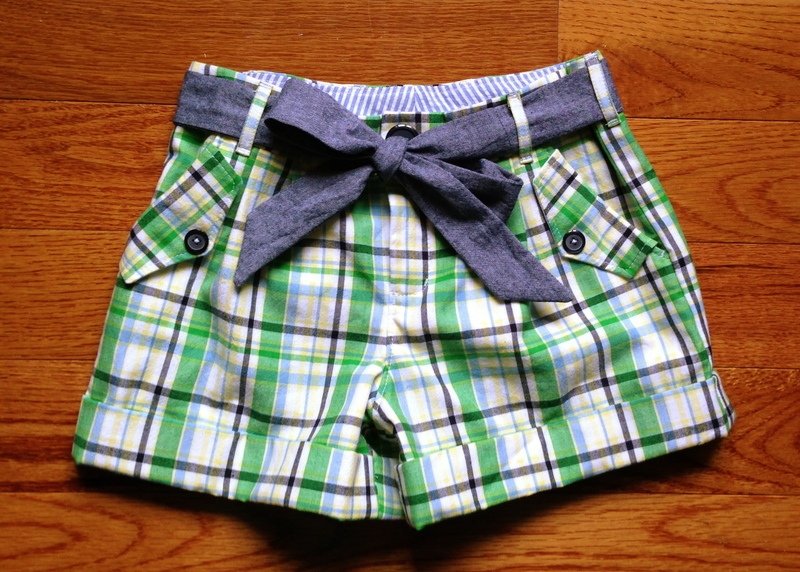 a couple weeks ago i set out to make these shorts for my nine year old, anastasia. there are precious few not super helpful reviews of this pattern, so i went into it armed only with my instinct. 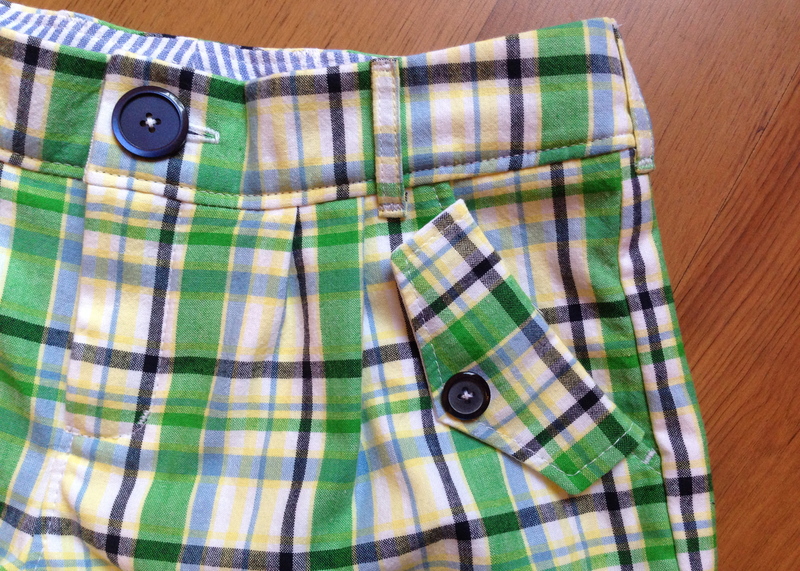 the pattern is designed to sit at the waist. i can’t speak for you, but i’m pretty sure i don’t know a single kid who wants to wear at waist anything. off the bat i lopped 1″ off the top, and also removed 1″ from the length. i drafted all the not included pieces (fly facing, fly shield, pocket facings, etc) and went to work. 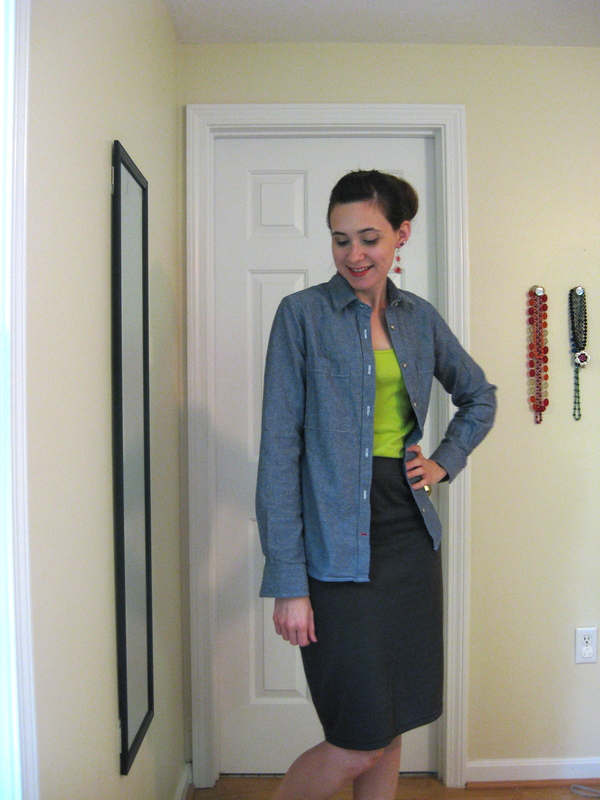 i had less than a yard of shirting fabric (from this make) but managed to fit it all in and match my plaids pretty well. since this was a shirting fabric, i underlined it in muslin to make sure the shorts didn’t end up see-through. 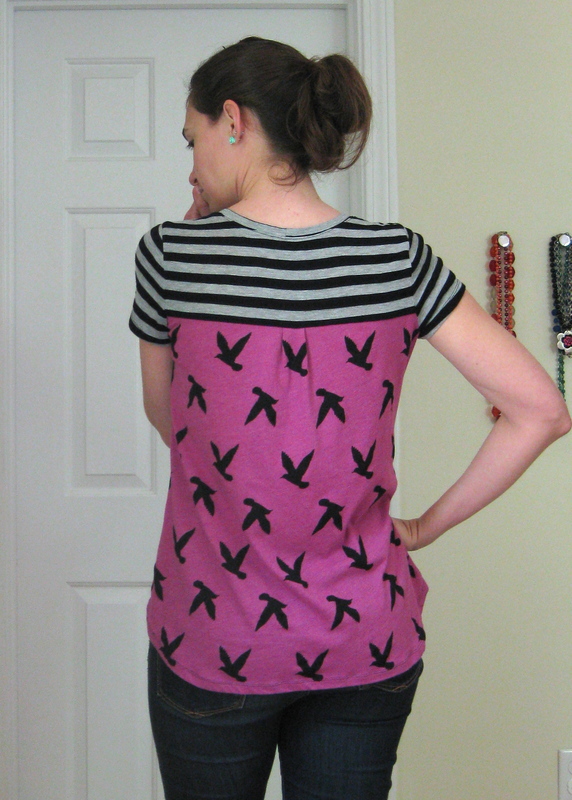 the pattern has a box pleat at the waist, which i thought looked strange, so i split the pleat into two regular pleats. i could have eliminated the pleats altogether, but aren’t pleats trendy at the moment? i don’t pretend to know, i just thought it was cute. i ended up cutting the waistband one size larger (since i lowered where the waistband was going to sit) and trimmed it down to fit. also, i added back patch pockets and belt loops. 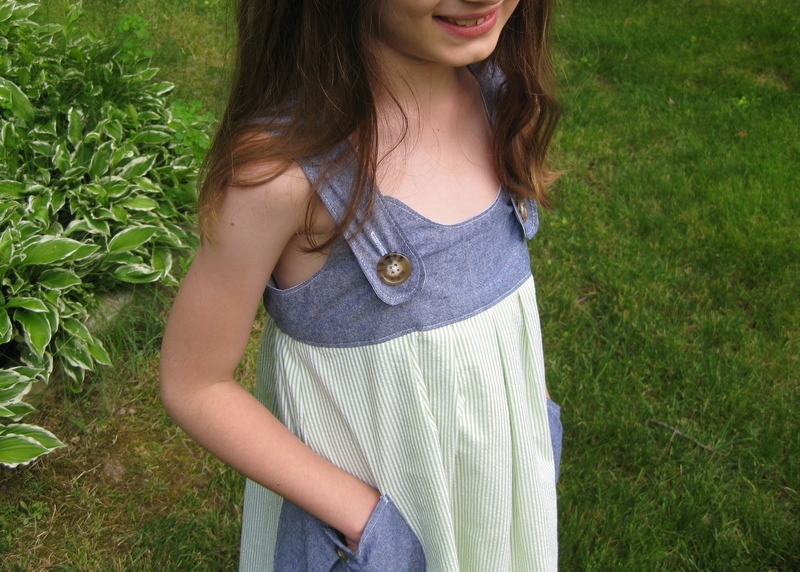 i had made a sash from leftover chambray scraps which she can use as a belt since the shorts are pretty roomy and would likely fall off otherwise. i made her a size 7 and they’re plenty big. i really like how these shorts came out and i already have another pair cut out in a lightweight denim, which hopefully i’ll get to next week. i have received a few questions about how i construct the zip fly, so i plan to detail my process in an upcoming post, as well as how to draft those mystery pieces that most patterns don’t bother to include. i have a few other things to post first, but i’ll get to it! well now i’m posting projects out of order, but is suppose it’s no difference to you. my ocd doesn’t approve, but it just so happens that i got great pics of this dress and wanted to share. 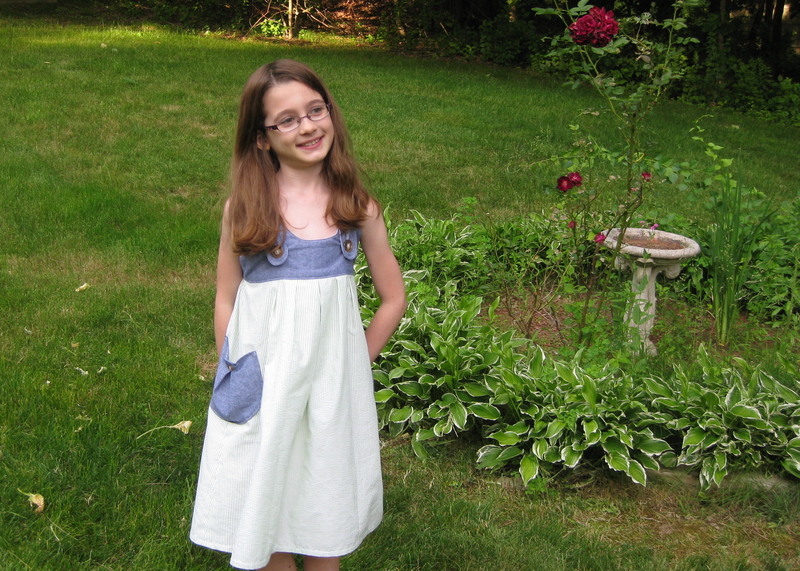 i dug through my kid patterns looking for something i could make out of specific fabric scraps i had in the too small to use for myself pile. 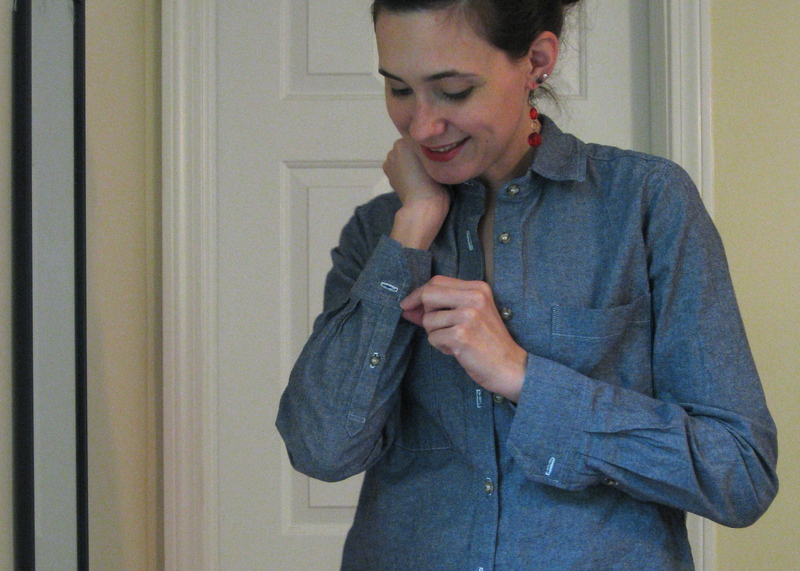 i came up with mccalls 5613 and set about doing view B. i made the top portion in leftover chambray from my much-beloved archer (i seriously wear that shirt 3-5 times a week. if you haven’t made an archer yet, why not?!) and the skirt portion from leftover seersucker from way back when. i was slightly hesitant that this might look a little young for my daughter; she is, after all, nine. and, can i just say, it is very hard to dress a girl her age. so much of what’s available in rtw just looks trashy. i don’t need to dress her in ruffled sappy little kid clothes, but surely there is some middle ground? anyways, back to the dress! 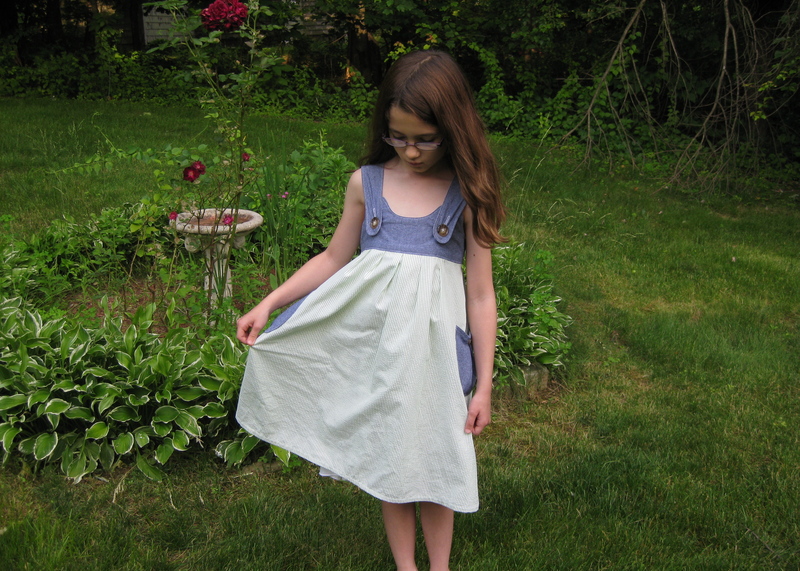 i lined the bodice in muslin, and the skirt in a lightweight poly lining. 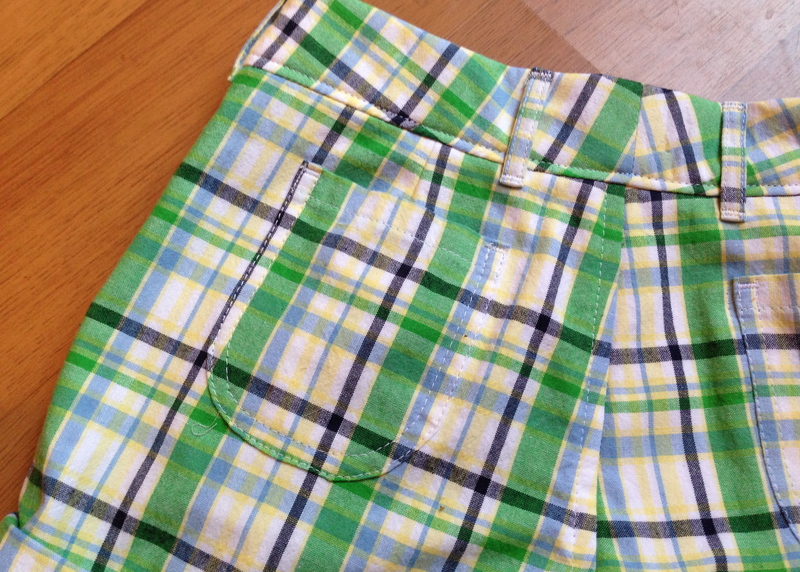 i try to avoid polyester, but i do like this lining for skirts. i don’t know what it’s called, but i pick it up at joanns for about $4/yd. it has a nice drape and just the right amount of opacity to work with a huge range of fabrics. i didn’t have much of it on hand, so for about the bottom third, i took six inch wide strips that i pieced together to make a long strip, ruffled with the serger and sewed on. 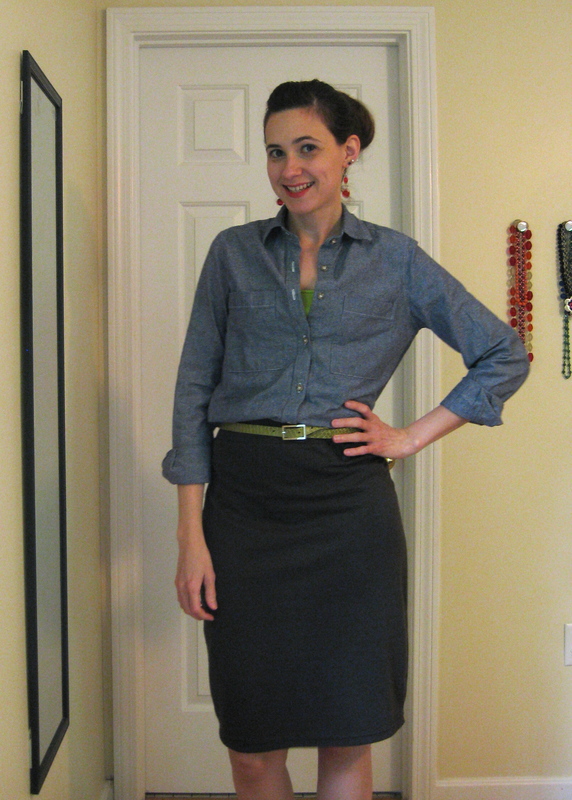 it actually worked out quite well and gave the skirt a little extra body at the hem. oddly enough, i almost like the back of the dress better than the front. 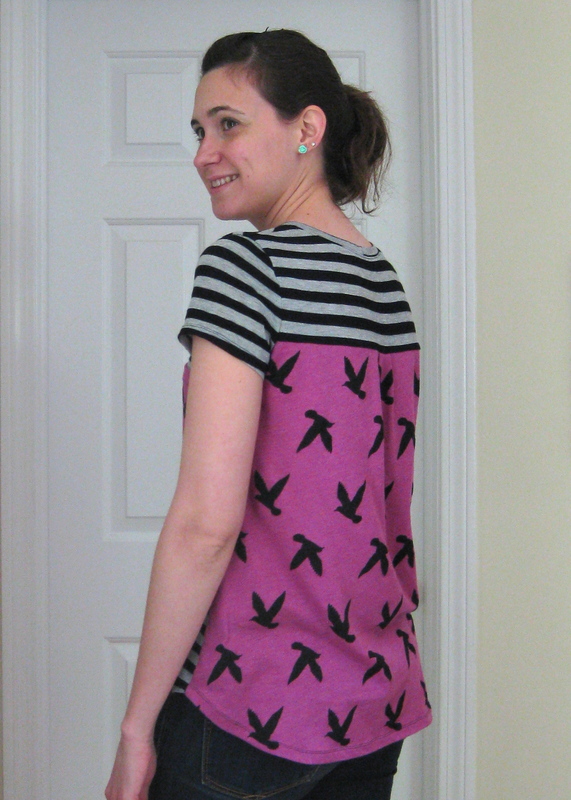 it’s a pullover dress, so the back portion has a casing made from the seam allowance with 1/4″ elastic threaded through. 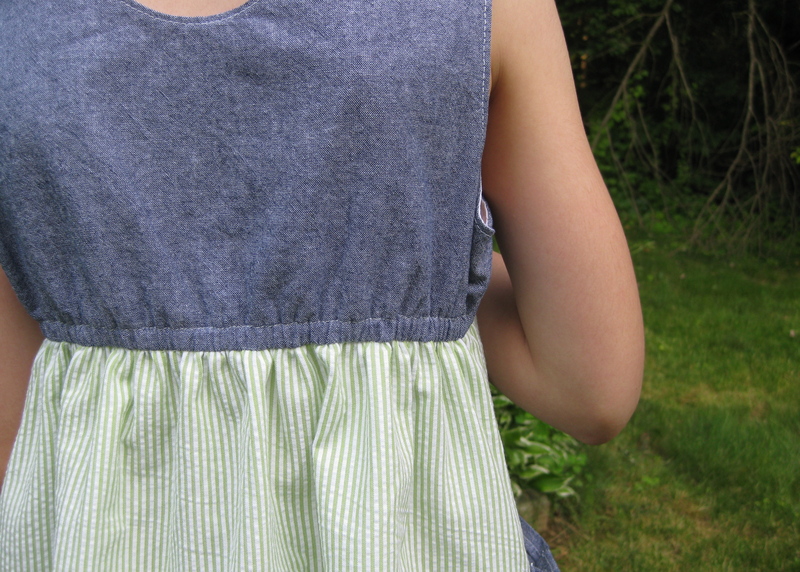 while the pleating on the front is nice, i may use this pattern again and re-draft the front to be more like the back and have it gathered and elasticized all the way around. i’m only so-so on the button straps. it’s cute, but the straps end up being cut on the bias and it just doesn’t feel very sturdy. it feels like it needs some interfacing, and the front of the bodice under the straps occasionally shifts out of place. you can see in the pics how there is some pulling where the buttons are attached. not a deal-breaker, but i would definitely make adjustments before doing another version. for size, i had the envelope that was 3T-6. i knew i needed about a size 7, and since the pieces are extremely not complicated, i graded it up a size. one thing i do like about this pattern is that the skirt is actually a-line and not just a gathered rectangle. 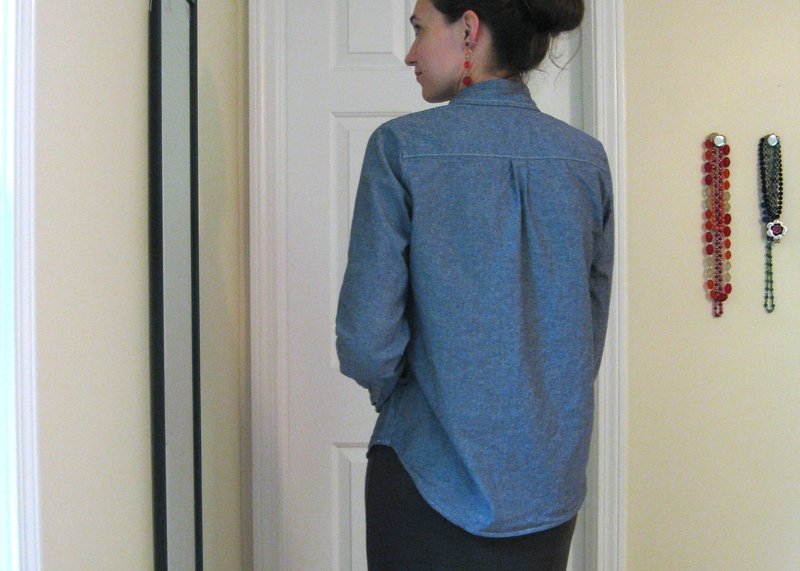 it really helps keep down the poofy-ness up top without sacrificing a nice full hemline. it seems many patterns have gone away from the a-line skirt in favor of a rectangle if it’s gathered, so props for that, mccalls. all in all, this is a nice pattern for a quick summer dress. 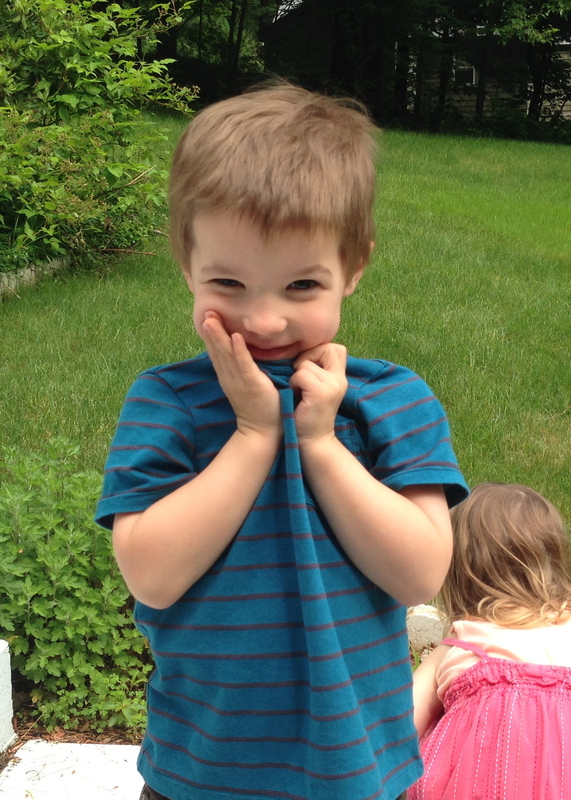 sorry for being so picture heavy, but my little photo-bomber was really hamming it up. happy summer! i really needed to do some sewing for the kiddos, so for the last couple weeks i’ve made almost exclusively kid stuff. i’ll try not to bore you too much, but i take the same approach with kid makes that i do my own. good techniques, finishing, etc. if you phase out, i totally understand. 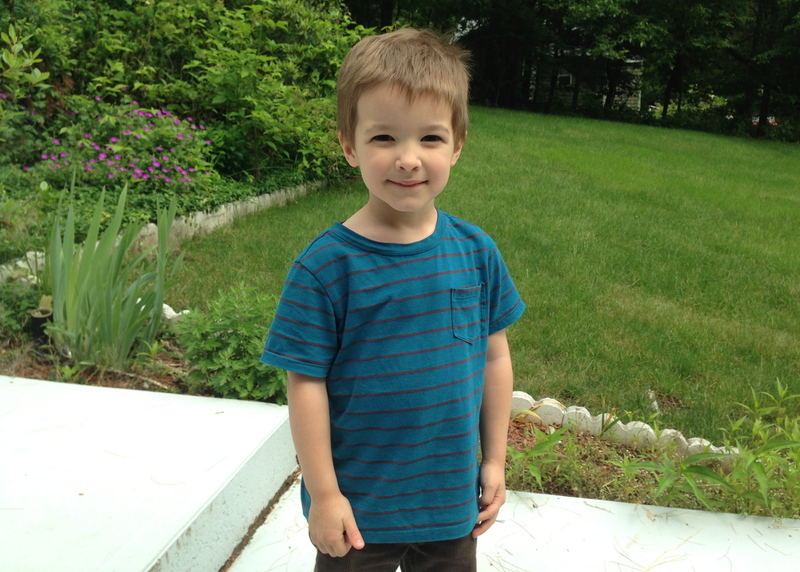 in fact i only follow a handful of sewing blogs that feature almost exclusively kid stuff. why? well a lot of it is way too crafty for my tastes and frankly, too picturesque. i mean really. who let’s their kids run around in a field of flowers with the sun at just the right angle to get that lovely glint… whatever. recently i have relented and added a few of those blogs to give me ideas for using up my too small to make anything for me fabric leftovers. so, while this may look like a kids’ make blog for a bit, things will return to normal in no time. promise! first up: a tee for my boy, oliver. 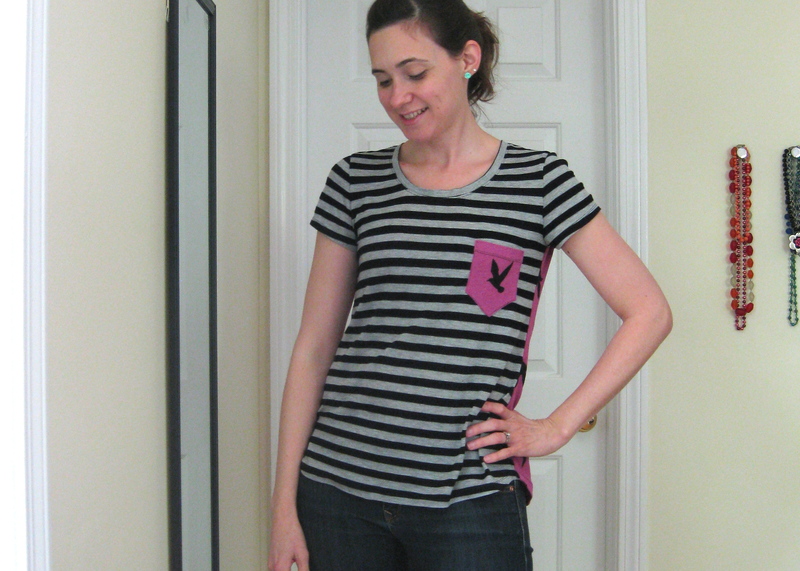 i got this stripy knit from girlcharlee.com and went back to the RTW tee tracing i made up here. i roughly graded it up a size so it should fit him awhile. 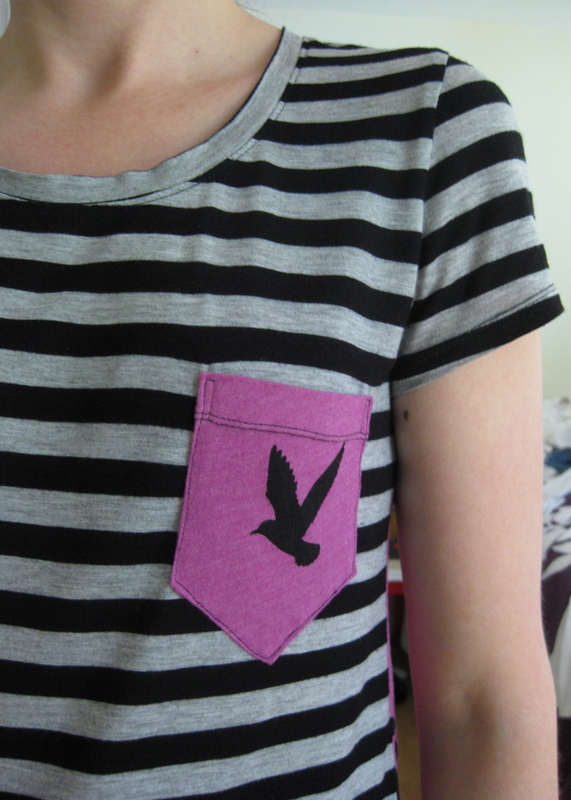 when i finished the shirt i hadn’t put a pocket on the front and he promptly asked me where the pocket was. 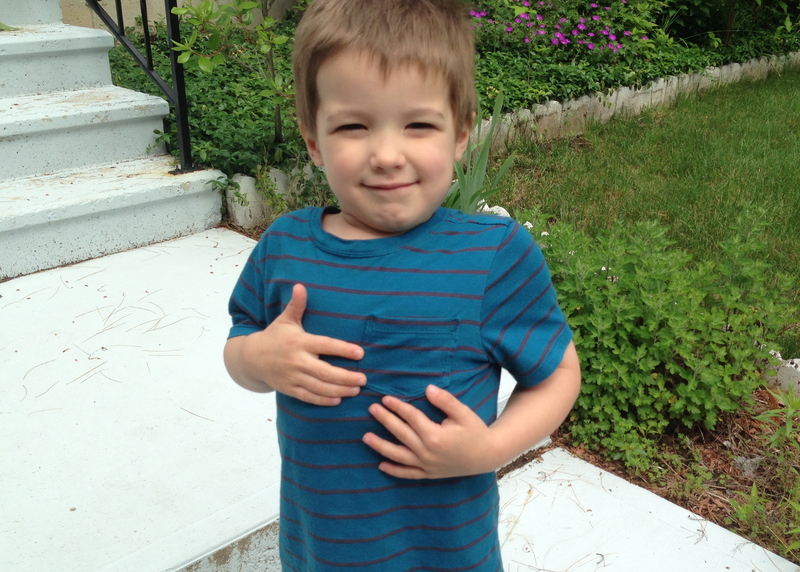 okay fine—i added a pocket and he said: “okay, now it’s finished!” the boy loves his pockets! don’t you just wanna squish him? he’s the most cuddle-tastic kid ever. 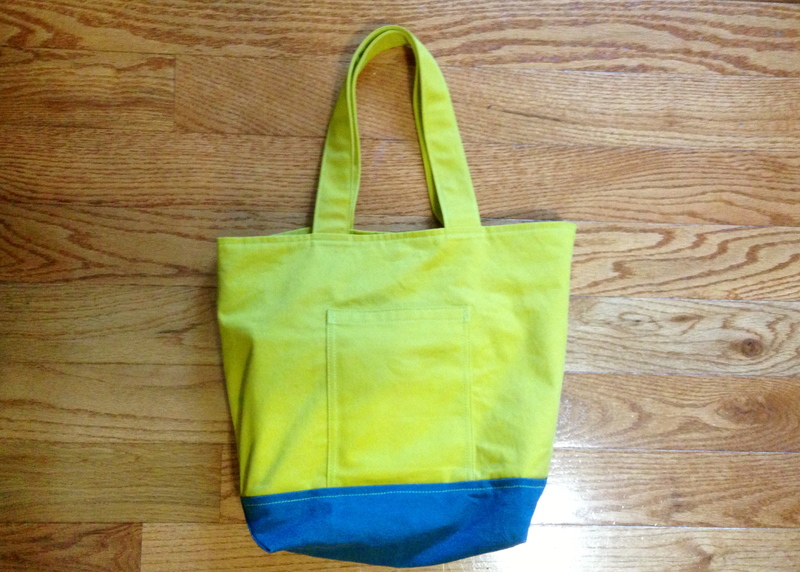 next i wanted to make a new tote bag for my daughter, anastasia, to give to her as a birthday gift. 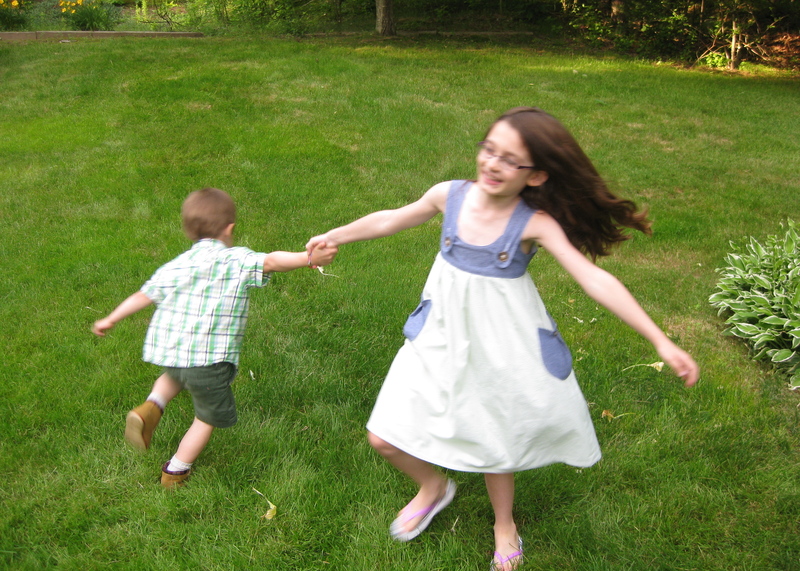 ohemgeee… she just turned nine. how the heck did that even happen? ahem. so she is a serious lover of books. she began reading at a very young age and by the time she was in kindergarten she had abandoned the picture books in favor of the boxcar children and nancy drew. she reads at an astounding rate (and finishes multiple books every day!) so it’s very difficult to keep an adequate supply of reading material. when we make our library visits, her tote bag is filled to the brim. craptastic pic… this color seriously messes with my camera! 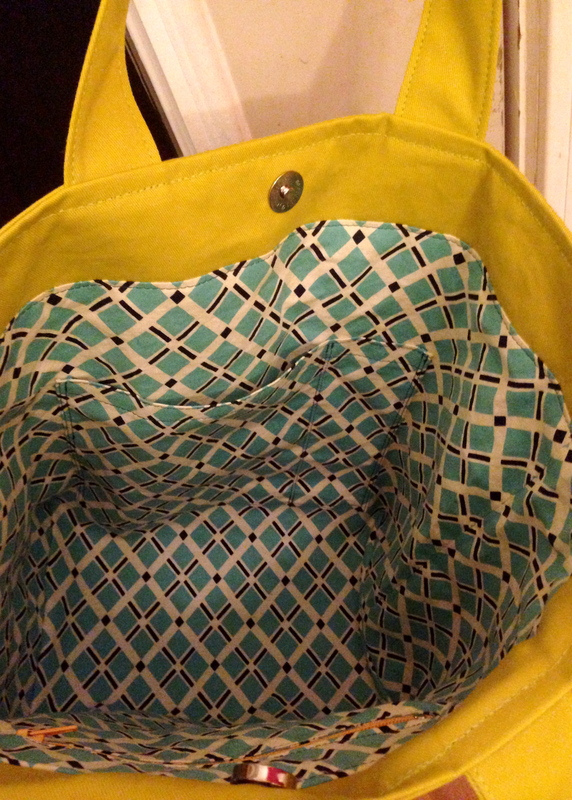 i noticed that having a wider based tote would make it so much easier for her to fill her bag—the 3-4″ bases most tote bags offer are just too narrow—so i cut the bag to have a wide 6″ base. instead of cutting off the excess at the bottom corners i topstitched it to the outside for a little extra book carrying durability. 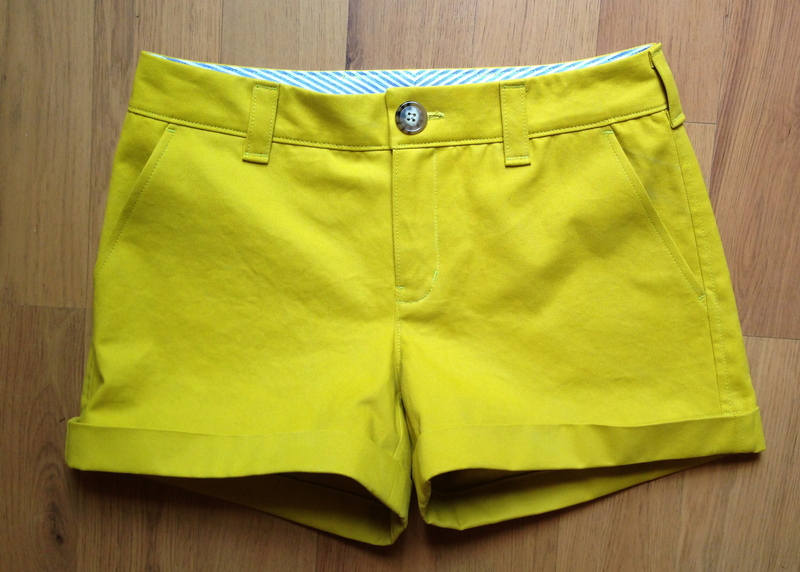 i used leftover fabrics from my most recent pair of shorts and the jacket i made for her last fall. 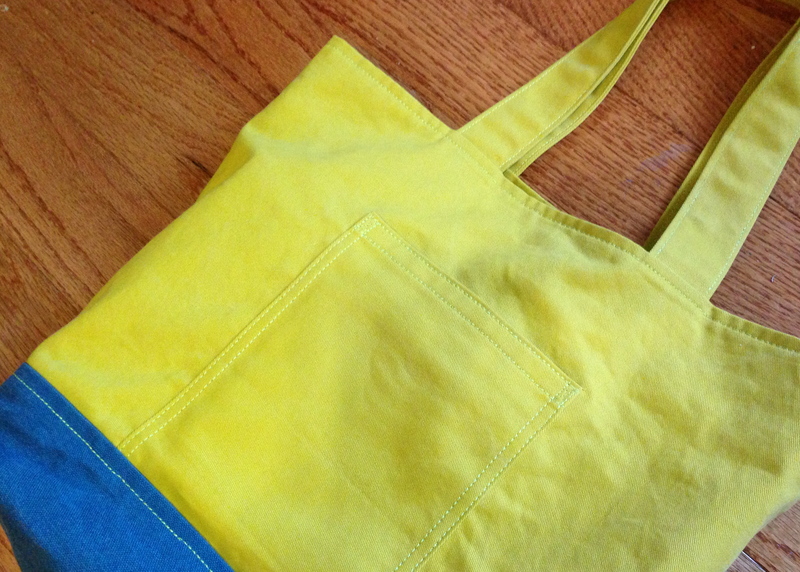 i picked up some quilting cotton to line the tote bag and make some interior pockets. she has a pocket to hold her kindle, another pocket to hold pens/pencils/etc. 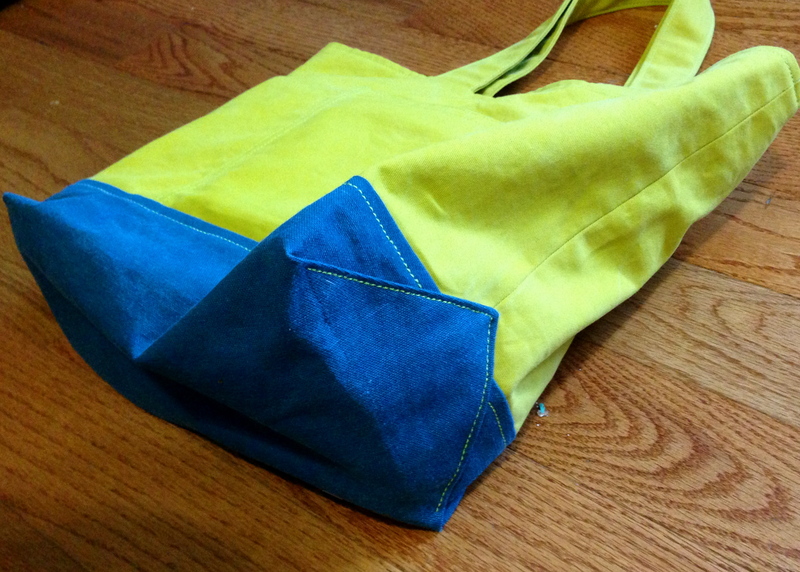 the other side of the interior has a zippered pocket. as a whole the bag turned out great! the only thing i was kicking myself for was not making the straps long enough to extend the whole width of the facing so i could topstitch an X for reinforcement. i used the triple stitch for all the topstitching since i didn’t have enough foresight to pick up topstitching thread. 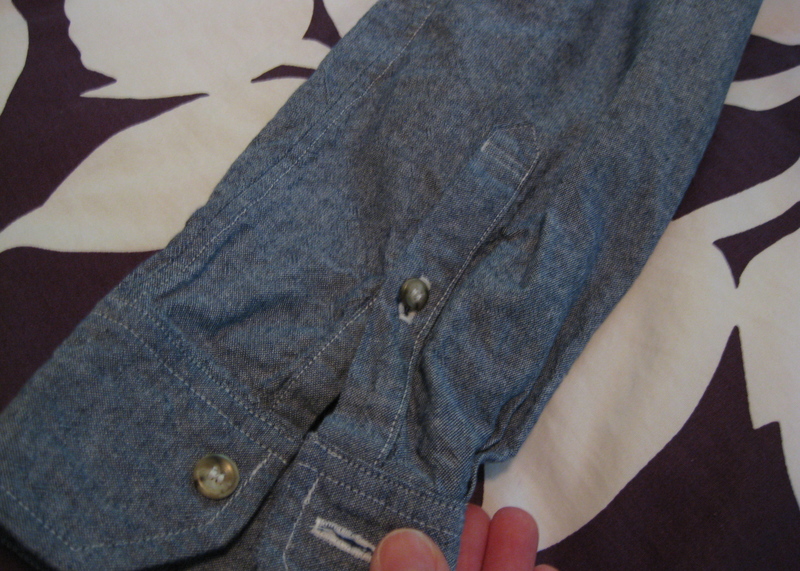 triple stitching is wicked annoying, but a single stitch just doesn’t have enough beef, imo, for this sort of thing. the bag was well-received and should last her many years to come. so may is technically longer than 4 weeks, but i have no intention of boring you with a 5th outfit post. you’re welcome. so… what have i learned? well i’ve learned that despite the fact that i put my hair in a pony tail almost every day i still don’t know how to do it stylishly. what? 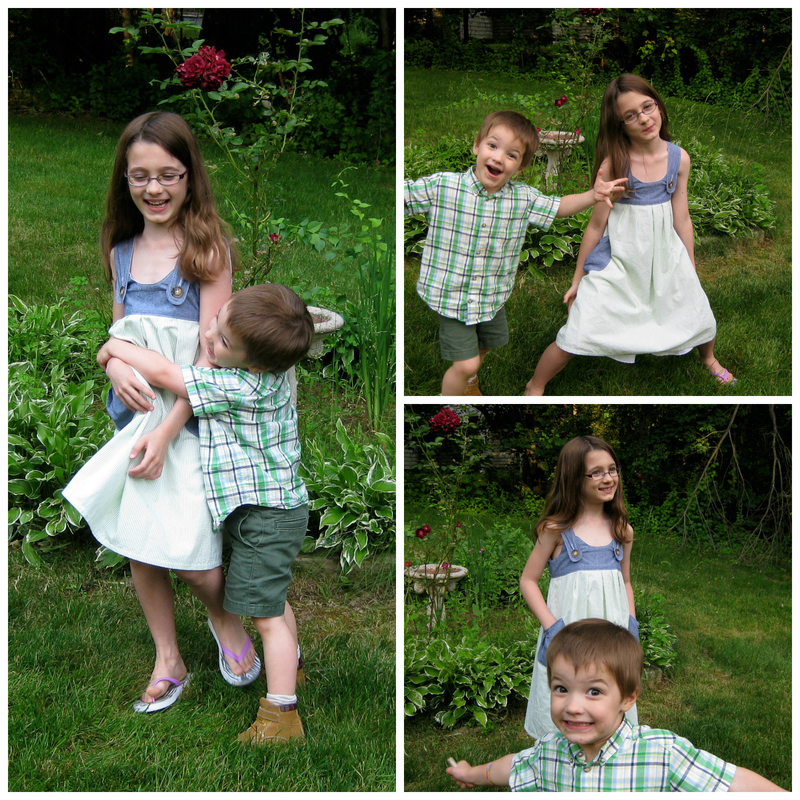 oh… what did i learn about my sewing and wardrobe? sorry… okay last year i really started to focus on making things that i needed and that would get daily wear. for me, that means casual tops, casual dresses, and casual bottoms. what can i say. i’m a stay at home mom, so most of my daily wear needs to be kid-friendly. i try to inject a little fun into my wardrobe and keep it above the sweatpants and ratty tee look. as far as identifying any gaps… i did notice that i’d like to have a few more woven tops (grainline’s tiny pocket tank and scout tee), a skirt or two (another moss mini, then maybe megan nielsen’s kelly skirt), some thurlow pants (slenderized and cropped), and while i’m at it, i love the knit dresses i have and could use a couple more of those! but, overall, it’s nice to see that i have been able to fill out my everyday wardrobe. just a year ago i didn’t have most of the garments you’ve seen this may. i only committed to wearing four makes a week, but i managed closer to six or seven; MMM or not, this is how i dress all the time now. in fact my husband commented one day: “you look weird; you’re not wearing anything you made.” ha! it was meant (and taken) as a compliment. so yeah, if you run into me on any given day most likely something i have on is self-made; and it is so satisfying to have gotten to that point! 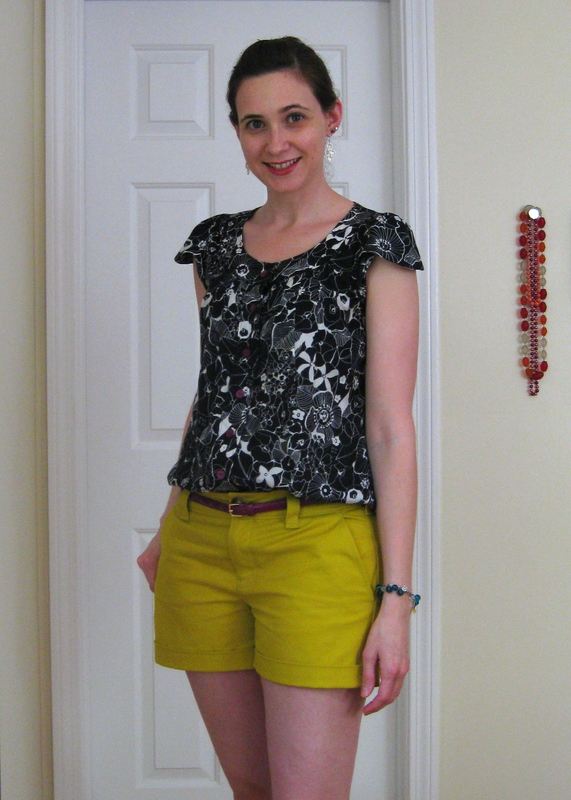 well, as you can see, i have some unblogged items to get to posting on… yay for not having to take daily pics anymore!! !